Volcanic gases are important eruption forecasting tools often used in volcano monitoring. However, collecting gas samples requires scientists to enter high-risk volcanic areas. This is where drones come in. Drones are the perfect tools for volcanologists to access these danger zones. Although they’re rapidly becoming popular among the scientific community for photography and aerial mapping, few studies have attempted to quantitatively measure gas emissions with drones [e.g., McGonigle et al., 2008; Mori et al., 2016]. A drone, or unmanned aerial vehicle (UAV), is a remote-controlled device that allows a pilot to remain a safe distance from an active crater while the drone is maneuvered to the site of interest. Drones can be piloted manually or with an autonomous navigation system. Compact gas sensors can be mounted onto the drone that take measurements while the drone is in the air. Last year, a team of researchers gathered in Central America for a 2-week excursion to test a variety of instrument and drone combinations. Their numbers included gas geochemists, volcanologists, physicists, engineers, and chemists from four institutions across Canada, Germany, and Costa Rica. Most, of course, doubled as drone pilots. Scientists measure volcanic gases for three main reasons. First, changes in the ratios of certain gases can indicate an imminent eruption. 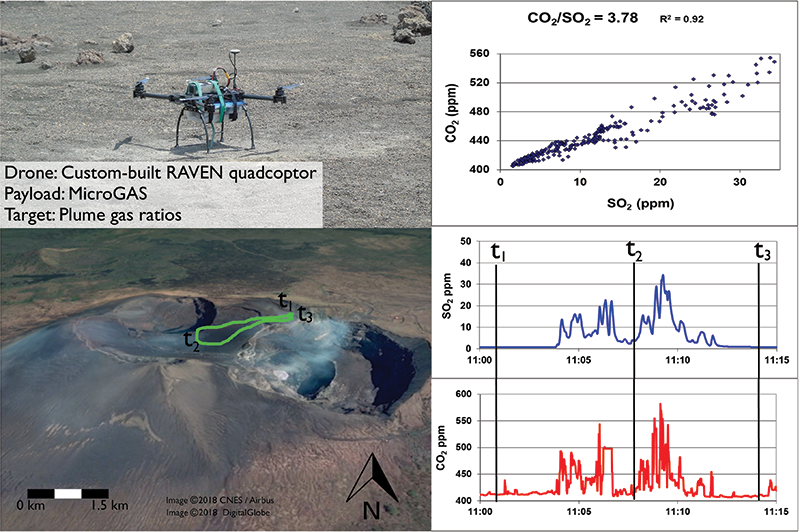 The concentrations of carbon dioxide (CO2), sulfur dioxide (SO2), and hydrogen sulfide (H2S) can be measured by flying the drone right into the plume of gas as it emerges from the volcano. Second, researchers need to know which reactive species are coming out of the volcano so that the interactions between volcanoes, climate, and ozone can be better understood. These compounds contain such halogens as chlorine and bromine, and a drone hovering directly in the gas at varying distances from the source can help scientists determine how the compounds change as the plume ages. Third, the total amount of gas being emitted can be used to calculate the exchange of volatiles between the deep Earth and the atmosphere. The emission amount can also be used to monitor volcanic activity. This is done by flying transects under the entire width of the gas plume to measure the output, or flux, of SO2. Usually, a researcher drives or walks under the width of the plume to collect the needed transects, but limited road access and obstructions at ground level often prevent or curtail surveying such transects. The drone bypasses these problems, is faster, and can even directly measure wind speed at plume height, which is a key variable for the flux calculation. By combining gas concentration ratios and SO2 flux measurements, scientists can also calculate the CO2 flux. 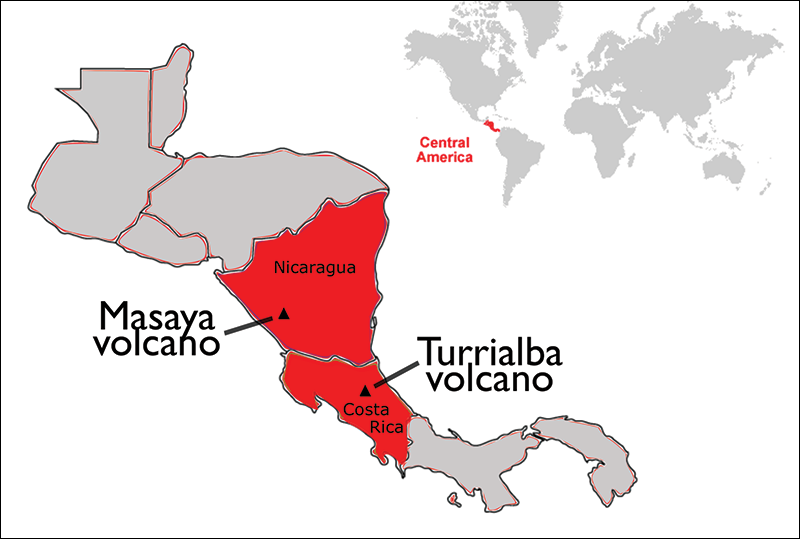 Turrialba and Masaya are Central America’s largest degassing volcanoes, with each having emitted well more than 4 million tons of SO2, among other gases, over the past 20 years alone (calculations are based on data from de Moor et al. and Martin et al. ). Both of these gas giants lie dangerously close to major cities, making them key locations to test new measurement techniques. Turrialba was sculpted by a series of violent eruptions during the past 10,000 years, but all activity came to a halt in 1866. Then, in 1996, the volcano sprang to life again. More than 20 years later, explosive bursts of ash frequently rise several hundred meters above the summit, causing havoc at the international airport in San José, Costa Rica’s capital. The opening of new vents and the escape of magmatic gas from intruding magma are the main drivers of the ongoing volcanic activity, and a small lava lake has been spotted forming at the bottom of the crater. Masaya is a different kind of volcano altogether. It is composed of a large caldera complex that formed 2,500 years ago, with volcanic cones rising from the floor of the caldera. One of the craters atop the largest cone hosts a vigorously bubbling lava lake that has attracted a multitude of tourists in recent years. Unlike Turrialba, Masaya has been persistently active throughout the past several hundred years, with a long-standing history of degassing from the surface of the lava lakes that have come and gone for centuries. The extraordinary degassing at these two volcanoes makes them ideal locations to test new drone-mounted instrumentation, thereby improving hazard assessments. For measuring concentrations of CO2, SO2, and H2S, we designed two compact variations of multiple-gas analyzers (Multi-GAS) for drone flights. Multi-GAS instruments are typically the size of a toaster and require heavy batteries and a case and are meant for long-term measurements atop a volcano. We created miniaturized versions weighing under 1.5 kilograms, around the size of a football. We named the two instruments MiniGAS and MicroGAS. MicroGAS was designed by the volcanology group at McGill University, and MiniGAS was designed by GasLab of the Universidad de Costa Rica. Both have varying sensor ranges, but both consist of a pump, electrochemical sensors, and onboard data loggers to store or, in the case of MiniGAS, transmit the data by telemetry. We also deployed a lightweight gas diffusion sampling device to measure halogen species and their compositional variations. This device uses a pump and glass tubes with reactive coatings, called denuders, designed to collect the desired halogen compounds. An SO2 sensor and additional wiring that connects to the drone telemetry system allow the pilot to remotely start the sampling once high SO2 levels are reached, signaling that the drone is in the plume. In addition, we built a drone-mounted miniaturized differential optical absorption spectrometer (DROAS) to make SO2 flux measurements. Typical instruments are also toaster-sized and weigh roughly 2–4 kilograms, plus they require a large battery and a computer connection; the DROAS weighs roughly 950 grams and contains a telescope, an ultraviolet spectrometer, and a microcomputer running the data collection program. We used two octocopters and two quadcopters for this expedition, which was conducted in late April 2017. The drones were flown in combination with different types of compact sensors and spectrometers. What drones we chose depended on the goals of the particular flight in question. For example, if the goal was to perform a DROAS traverse, which requires covering a large distance (a kilometer or more) beyond the line of sight, then a sturdy octocopter with autonomous flying capability was ideal. If the goal was to fly straight up until the gas plume was reached and then hover there as long as the battery allowed, a manual flight by a lightweight quadcopter was best suited to the mission. The team discovered the suitability and limitations of each drone and created an effective protocol for assessing when and where it was useful or too dangerous to fly each type. A preflight checklist was used to ensure that wind, fog, and other hazards were taken into consideration and that any bystanders in the area were in a safe viewing location. We flew a dozen missions at Turrialba and Masaya from the crater rim, from the base, and downwind from the plume at each volcano. Each of the instruments was deployed, sometimes in tandem, on at least one drone. During these flights, we successfully entered the volcanic plume to measure SO2 and CO2 concentrations. We also conducted several flight transects to estimate SO2 flux values. Examples of these missions can be seen in Figure 1 and in the video below. Fig. 1. Sample flight mission showing the carbon dioxide/sulfur dioxide (CO2/SO2) ratio measured in the plume of Masaya volcano. At t1, the drone takes off from the edge of the crater. At t2, the drone passes through the plume and turns around for the return journey through the plume again. At t3, the drone lands back at the start location. 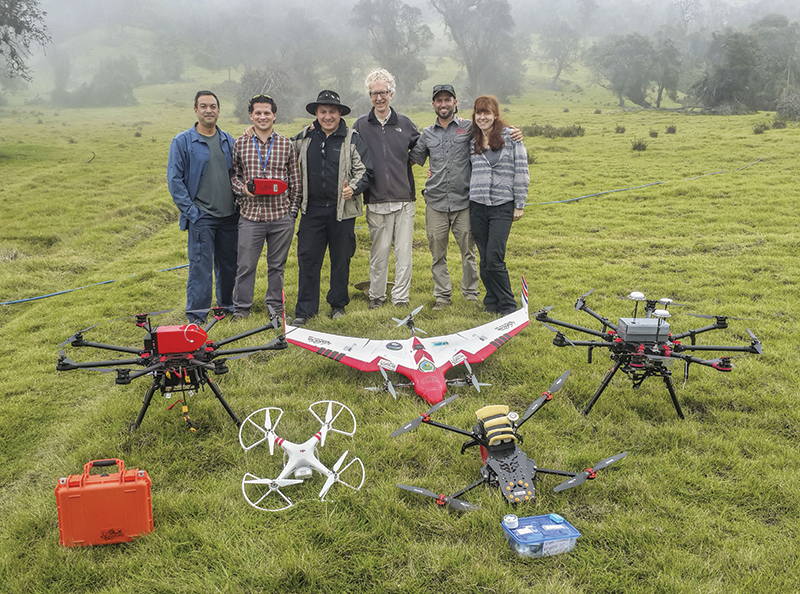 Researchers demonstrated an array of drone and sensor capabilities in volcanic gas plumes during 2 weeks of field testing in Costa Rica and Nicaragua. At the same time, we learned countless lessons about the adaptability and preparedness needed to undertake such a task. In addition to acquiring permits, customs letters, plane-approved batteries, and spare parts prior to travel, coordinating with local authorities proved vital to dealing with the surprises that abounded at every stage of the fieldwork. With proper safety measures and permissions in place, this kind of work could revolutionize volcanic gas measurements made at volcanoes without ever putting the researchers in danger. New ash deposits and crater lakes could be sampled during eruptive periods. Instrumentation could be deployed in craters by drones. The possibilities are endless. We thank the Observatorio Vulcanológico y Sismológico de Costa Rica (OVSICORI) and the Instituto Nicaragüense de Estudios Territoriales (INETER) for their aid during the field campaign. We also thank José Pinell and the Instituto Nicaragüense de Aeronáutica Civil (INAC) for their assistance in Nicaragua and the Vicerrectoría de Investigación and Centro de Investigación en Ciencias Atómicas, Nucleares y Moleculares (CICANUM) from the Universidad de Costa Rica for their support on the CARTA-UAV research project. de Moor, J. M., et al. (2016), Turmoil at Turrialba Volcano (Costa Rica): Degassing and eruptive processes inferred from high-frequency gas monitoring, J. Geophys. Res. Solid Earth, 121, 5,761–5,775, https://doi.org/10.1002/2016JB013150. Martin, R. S., et al. (2010), A total volatile inventory for Masaya Volcano, Nicaragua, J. Geophys. Res., 115, B09215, https://doi.org/10.1029/2010JB007480. Mori, T., et al. (2016), Volcanic plume measurements taken using a UAV for the 2014 Mt. Ontake eruption, Earth Planets Space, 68(49), 18 pp., https://doi.org/10.1186/s40623-016-0418-0.